MOEEBIUS Final Conference video is available! We are proud to inform that video covering the course of MOEEBIUS Final Conference is available! 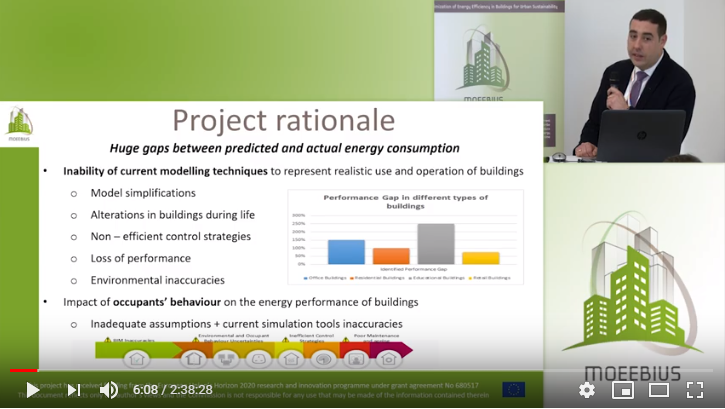 This quite long footage (2'38") presents material recorded during MOEEBIUS project workshop organized within the framework of World Sustainable Energy Days 2019, in Wels, Austria, on 28th of February. Our speakers: Ander Romero, Pablo De Agustin (Project Coordinators - Tecnalia), Filipe Silva (ISQ), Jakub Malanik (Honeywell), Brendan O'Flynn (Tyndall), Georg F. Schneider (THN), Mircea Bucur (KIWI) and Michele Vavallo (Solintel) had an opportunity to share details on specific aspects of MOEEBIUS project with the audience connecting people from business, research and the public sector. The conference entitled: "Higher energy efficiency and lower business risk - reducing the energy performance gap in buildings" gathered the interest of its attendants who were encouraged to ask many inquisitive questions. Discussion pannel of the conference is presented in the final fragment of this movie. Eager to know more about MOEEBIUS? Don't hesitate to watch our video!! !